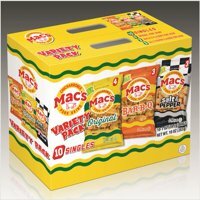 Product TitleMac's Original Pork Skins Party Size!, 8.5 Oz. Product TitleMac's Bar-B-Q Pork Skins Party Size!, 8.5 Oz. Product TitleMac's Spicy Buffalo Flavored Pork Skin, 5 Oz. Product TitleMac's Spicy Pork Cracklin Curls Party Size, 5.5 Oz. Product TitleMac's Chicharrones Pork Cracklin Curls, 5.25 Oz. Product TitleMac's Fire Pork Cracklins, 6.25 Oz. Product TitleMac's Golden Cracklins, 8 Oz. Product TitleMac's Chicharrones Red Hot Pork Skins, 2.5 Oz. Product TitleMac's Caliente Hot Flavored Pork Skin, 2.5 Oz.